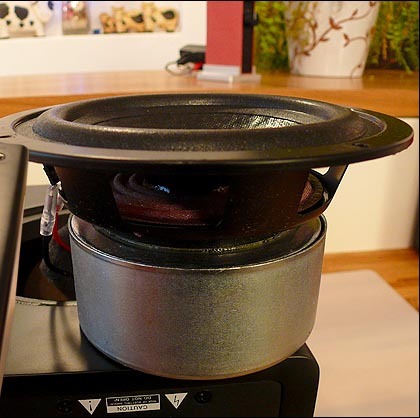 Source: Raysonic Audio CD-168, MacBook Pro 17"
which all modern bass extender cubes must have. Now deliberate terminology. The NuForce W-1 is a bass extender. In the original hifi sense of full range, it's far from a subwoofer. But, there are the dwarfish performers on the 3 to 4 foot wide soundstage of the desk top with its 2-foot height fixed between writing surface and tweeters. Those dwarves make full-range bass to 20Hz unrealistic and entirely disproportionate. 50Hz is sufficient to keep the whole experience scaled back to size and musical instruments and singers tonally centered or grounded. 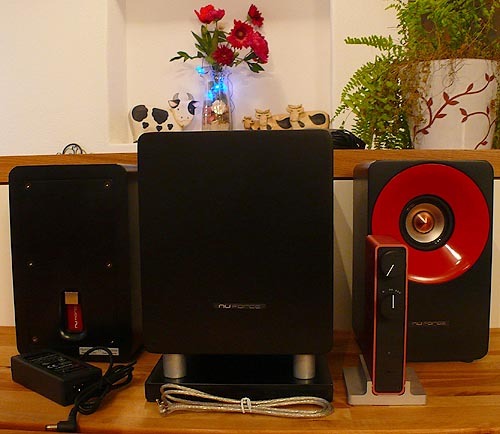 Hence the term 'subwoofer' has migrated to mean something less for PC audio than hi-end. It's obvious that a 6.5" 2-way floorstander has no use for a single 5-inch woofer cube. Heck, it goes lower on its own and does so in stereo, not mono. It's all about the right tool for the job. 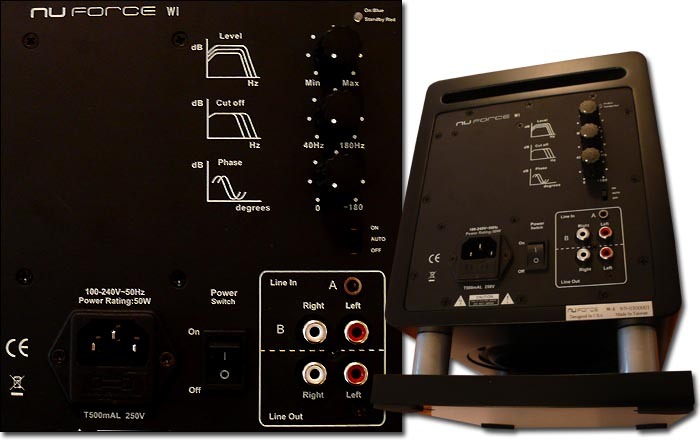 NuForce's second take on the Icon/S-1 computer audio proposition now reads: "With its variable crossover and phase-adjustment features, the high-performance NuForce W-1 subwoofer is designed to operate seamlessly with our Icon and S-1 systems for a low-end extension to 50Hz." So what did NuForce make us? The W-1 is a 5.25" paper-cone driver, down-firing affair with a slotted rear port. There are RCA line-level inputs plus a 3.5mm stereo socket to connect to the Icon; RCA stereo outputs; 0-180° variable phase; a 40-180Hz variable low-pass; an attenuator covering a +/-10dB range; a small blue/red power LED for on/standby on the back; and MDF construction in Henry Ford black. Aluminum stand-offs between box and plinth establish a fixed radiation resistance for the driver and can be blue, red, silver or black to match available Icon and S1 trim options. 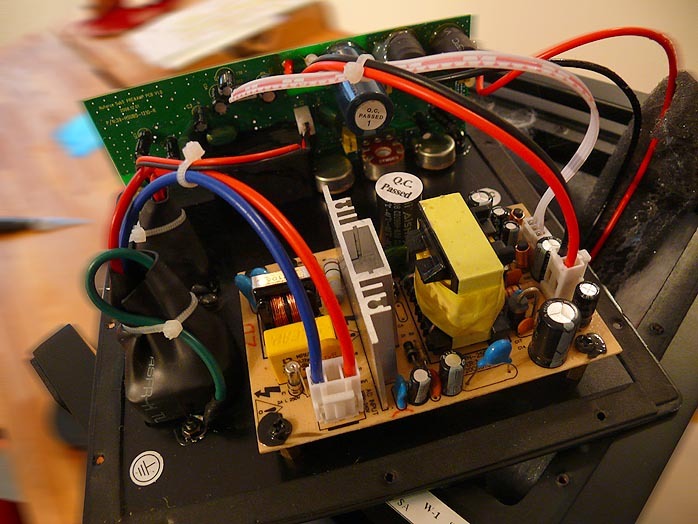 The 50-watt plate amp of course runs a switching power supply. This means line voltages from 90 to 264VAC are okay just like they are for universal laptop supplies. Frequency response is published as 50Hz to 150Hz +/-3dB. This sounds realistic considering the size of box and driver. Dimensions of 268.5 x 190 x 240mm HxWxD (10.6 x 7.5 x 9.45 in inches) and weight of 6kg/13.2lb make the W-1 as petite as reasonable and just slightly taller than the S-1s. In some installations, it might double as a pedestal for dimensionally challenged computer monitors. The W-1 ships with a shielded silver-weave 3.5mm to 3.5mm interconnect and a generic power cord. 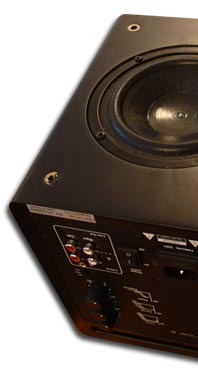 The matching S-1 speakers with their telltale waveguide terminate in Ethernet sockets. Those correspond with identical sockets fitted on the diminutive Icon integrated. Ethernet cables are included with the speakers. They are prewired to automatically engage the active EQ circuit inside the Icon. That compensation circuit counteracts the response anomaly of the shallow miniature horn. The S-1 thus must be run with the Icon and those cables. Otherwise Lowther shout is your uncle*. * Peculiar to Lowther's wideband drivers, this term refers to a built-in frequency response rise that tends to occur between 1,000 and 4,000Hz in the so-called presence region and renders particularly female vocals and plucked strings forward and unduly bright or energetic. twice the current (3A) and nearly twice the power (45 watts). But lest you believe that Casey Ng re-entered our hifi critics' ring with no extra impress-ya stuff, you'd be mistaken. After all, what does the above 4-piece computer audio system still lack to be complete? What's the 3.5mm socket on the Icon's face there for? Headphones, bien sur. 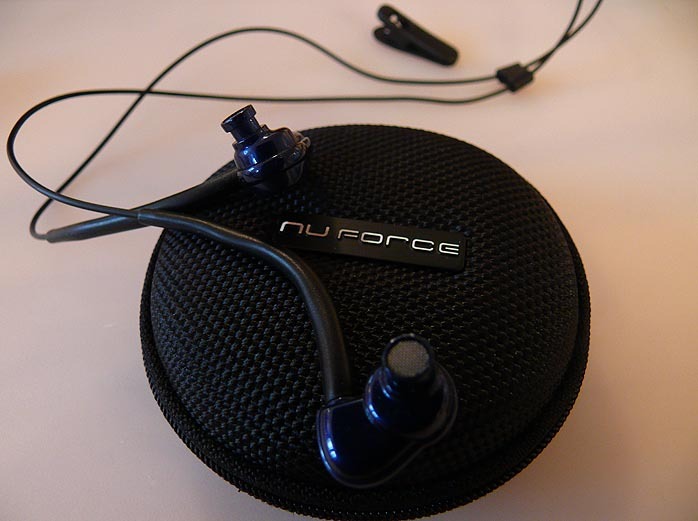 So NuForce has released two 9mm in-ear bud versions for their nuforce-icon web portal. Those are dubbed the NE-7M and NE-8. Refer to the website for details. Suffice it to say that they're iPod tiny, come with replacable rubber seals of different sizes to fit various ears and ship out with small zippered pouches for on-the-go mobility. Casey dispatched one set of each for my second date with the NuForce desk-top system. I'm far from experienced with this genre of cans, listening to upscale full-size audio-technica W-1000s or rewired AKG K-1000s instead. My only ear-bud exploits have been with the terminally sick airline freebies. I was thus curious what the NuForce men had wrought. 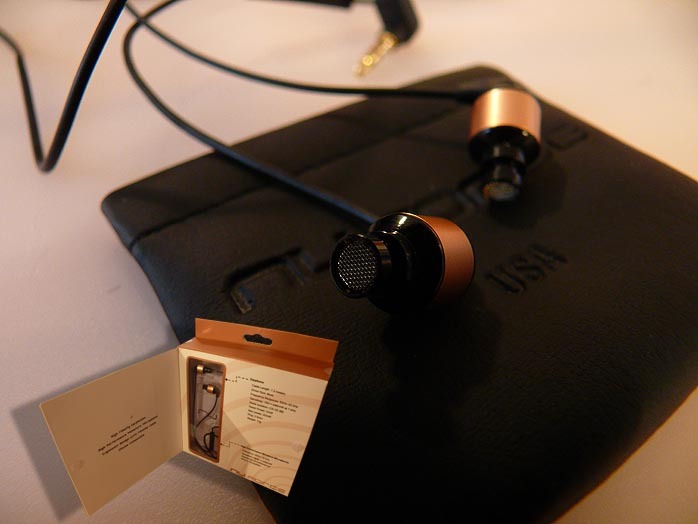 But iPod fanatics hip to all the higher-end ear-canal cans should think of mine as newbie comments without real traction. That admitted, I was pleasantly surprised. Strangely, the Icon produced a mild white hissing sound that remained steady up to 9:00 o'clock on its dial, then attenuated and over the ear buds, became inaudible at 10:00 where my music listening commenced. While technically not free of noise, the Icon was without self noise where it mattered. You won't be of course. The moment you seal your ears, be it with in-ear 'phones or your fingers, bodily self noises like inhalations become a lot louder. So it takes getting used to the physical insertion sensation of such designs. The biggest of the rubber seals fit me well and went in and out without detaching from their metal stems. Of course being nearly fully shielded from external sounds requires creating appropriate circumstances. The lack of aural feedback from your environment must be safe for you and others. Whether you ultimately find this form of listening physically and psychologically comfortable and preferential to a pair of Grado SR-60s for the same price is impossible to predict. I'm a Grado man, having listened to the 60s just a few weeks ago off a friend's iPod. Sonically, the 'bigger' NuForce 'phones (the sealed body is bigger, not the driver nor the actual shaft that gets seated in your ear) seem more lit up, making the 7s a tad more chilled out. The former are more energetic and ultimately informative but that difference is slight. Both are very PRaTty for great rhythmic elan and on-the-beat propulsion. The intensely direct general character could be common to the breed. Lacking what I refer to as connective tissue -- a quality particular to top-shelf direct-heated triode amps -- this sound is somewhat abstract in that's it about the facts, not the poetry. You could call it a minimization of textures. Bench testers might call it lack of coloration instead. Regardless, the Icon prevents outright coolness. The end result is a combination of Pass Labs X-class resolution with very minor softness, the latter not a function of stuff hanging between the notes as shadows and around them as halos but of a small transient softness. While the sound is very quick indeed, it doesn't telegraph hyper speed with undue zing on attacks. It's down to high resolution and focus and a somewhat uptilted balance. The latter is partly psychologcial since it's the usual weightiness and impact in the lower octaves which are leaned out. As we'll see, the NuForce desk-top system of Icon with bigger power supply and W-1/S-1 sub/sat speaker set has morphed into award-winning stuff. I'll exclude the 'phones from that endorsement however. I find the Grados far more comfortable and sonically more substantial. I'm also old enough to not worry about what others might think. Youngsters in the subway or on their hood's turf however might not be spotted dead with a clunky set of full-size headphones. They need to be stylin'. Enter the cool factor of invisibility and the hi-rez NuForce solution. That's the intended fit anyway.